During the North Carolina Gold Rush, the Charlotte Mint was Born. 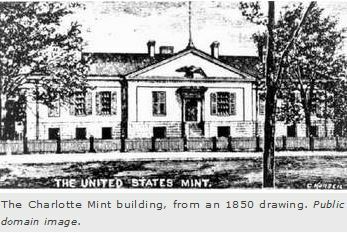 The Charlotte Mint was one of the first branch US Mints. Processing ore from the nearby North Carolina Gold Rush fields, the Charlotte Mint struck gold coins continuously from 1838 until the opening salvos of the Civil War in 1861. Coins from the Charlotte Mint are some of the rarest and most valuable coins in American numismatics. Hit the "Saga of the US Mint" link at the upper right to choose other US Mint facilities to study. The headings directly below are units of the Charlotte Mint chapter. In the years when George Washington was still our president, gold was discovered in Cabarrus County, North Carolina. By the early 1800's, over a million dollars a year in gold was extracted from North Carolina mines. It wasn't until the 1820's, however, that the North Carolina gold rush finally hit full stride, thanks to improved mining techniques. Second only to agriculture, gold prospecting became the chief source of employment in the state, concentrated in the southern Appalachian region. Until the discovery of gold in California in 1848, North Carolina was the top gold-producing state in the nation. Finding productive gold mines was challenging enough, but getting the precious metal to refiners back East proved to be even more so. Some of the raw gold that managed to elude trail bandits and unfriendly Indians was coined in Philadelphia and then returned over the same treacherous paths to supply coinage to people living in the South. With so much gold being found in North Carolina, but no easy access to the markets and no coining facilities within 500 miles, various lobbies clamored for the creation of a United States mint somewhere near the North Carolina Gold Rush fields. On March 3, 1835, Congress approved an Act to establish several branch mints. The Act, in part, stated that "... one branch [to be established] at the town of Charlotte, in Mecklenberg County, in the state of North Carolina, for the coinage of gold only...". Thus, the Charlotte Mint was born. After being signed into law by President Andrew Jackson, the Act also authorized branch mints at Dahlonega, Georgia, and New Orleans, Louisiana. An 1839 quarter eagle minted at Charlotte, North Carolina. The large mint mark "C" is seen above the date. Photo courtesy of Ira & Larry Goldberg Coins& Collectibles, Inc., Beverly Hills, CA. The inception of the first offshoot mints occurred during an age of rapid expansion for the United States. We have a very fine section, The Mint Branches Out as the Nation Grows, detailing the historical events surrounding the addition of new coining facilities, far removed from the Mother Mint in Philadelphia. Construction of the Charlotte Mint building began in 1836. On July 27, 1837, its doors were opened for business. At first, only raw gold was processed and refined. 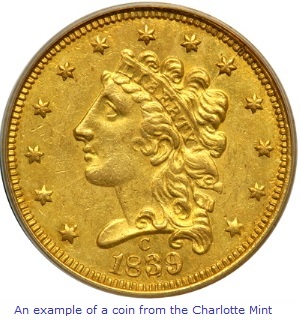 It wasn't until March 28, 1838, that the Charlotte Mint struck its first coin, the $5 gold half eagle. Later that year, $2½ quarter eagles were minted on Charlotte's state of the art machinery. The smaller gold dollar debuted in 1849. In all, over $5 million in gold coinage was issued by the Charlotte Mint before it fell victim to the whirlwind of history. Following the election of Abraham Lincoln, North Carolina seceded from the Union on May 21, 1861. The following day, the state joined the Confederacy, bringing the federally owned Charlotte Mint under southern contol. Using federal dies, coining continued for nine more days before closing down the mint. 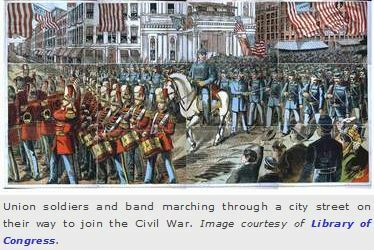 It had become obvious that issuing coins amid the anxiety of the Civil War was a futile effort. Of the 8,879 $5 half eagles struck at the Charlotte Mint in 1861, the Confederates struck 887 of them during those nine days. It is impossible to distinguish the "southern" coins apart from those produced under US authority. During the war, the mint building was converted by the Confederates into a hospital and military offices. Following the conclusion of the Civil War, the Charlotte Mint building was used by federal troops for the first few years of the Reconstruction era. In 1867, the US government designated the facility as an assay office, a capacity in which it operated until 1913. However, the facility never did regain its official mint status, drawing to a permanent close the glory days of the Charlotte Mint. The Charlotte Mint in its original location. The historic building was nearly razed in 1931. 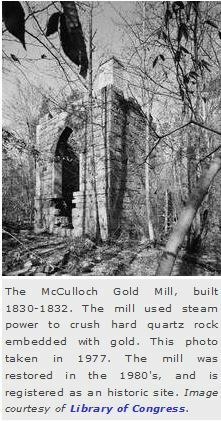 Image courtesy of Charlotte-Mecklenburg Historic Landmarks Commission. In 1931, the old mint building was being targeted for demolition, to make space for expanding the post office next door. In 1933, a coalition of citizens acquired the structure from the US Treasury. The group then paid $950 to the WPA to have it disassembled one piece at a time and relocated to the Eastover neighborhood, located a few miles south of downtown Charlotte. 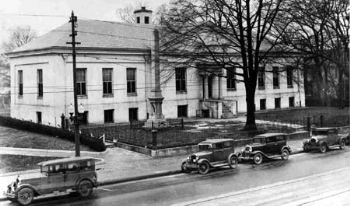 In 1936, the building was dedicated as the Mint Museum of Art -- the first art museum in North Carolina. In addition to viewing a complete set of gold coins minted in Charlotte from 1838-1861, visitors to the museum enjoy many interesting art collections, American and European ceramics, historic costumes and accessories, historic maps, and photography. The reconstructed Charlotte Mint today, on the grounds of the Mint Museum of Art. The old mint is a registered as a federal historic landmark. Image courtesy of Charlotte-Mecklenburg Historic Landmarks Commission. Since Charlotte gold coins are extremely scarce and are some of the most highly desired subjects in numismatic circles today, the museum's coin collection is indeed quite valuable. North Carolina gold mining continued for many years beyond the life of the Charlotte Mint. The last mining company went out of business in 1999. The Mint Museum organization constructed another facility in uptown Charlotte, completed in the fall of 2010.